Due to its diverse geography, geology, and climate, Wisconsin has a wide variety of wetland habitat types. Three primary factors influence a wetland’s type: hydrology (the timing, frequency, and amount of water found on the site), soil type, and the plant life the site supports. People have developed a variety of classification systems for grouping and naming the different types of wetlands, so you may see different names used by different groups. 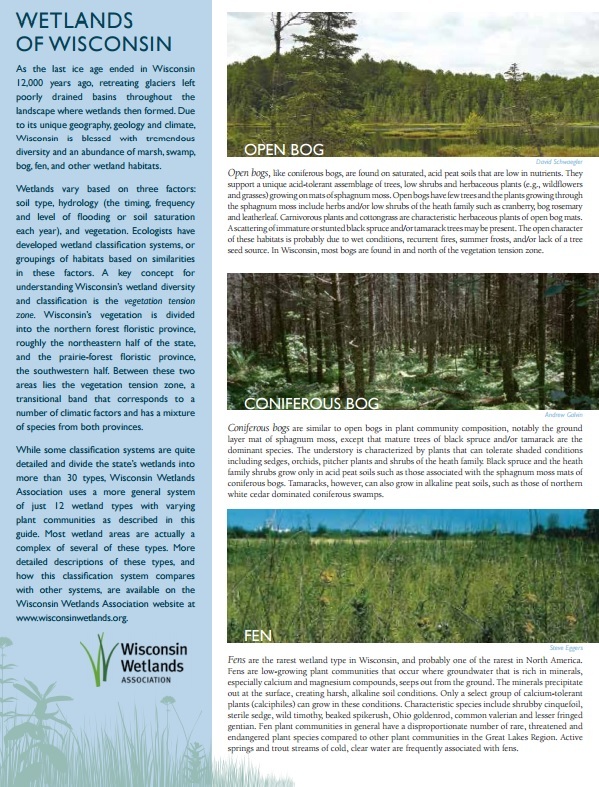 Use the links below to explore the types of wetlands found in Wisconsin and the plants and animals that can be found in each. You can also download our detailed guide to wetland types. This printable guide is a great resource for classrooms or field trips.